Need to know how to grow potatoes in your garden? Spoiler: It’s easy! Baked, fried, mashed or roasted, potatoes are a much-loved staple in many households across the country and around the world. It’s no surprise to find them in many gardens. Considering growing potatoes in your backyard garden this year? This quick guide will walk you through the process! 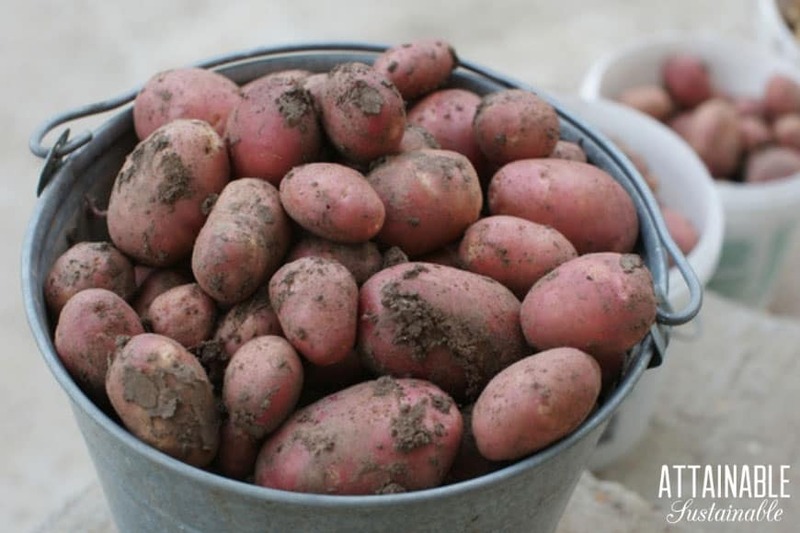 Whether you’re just discovering your green thumb or you consider yourself an experienced grower, potatoes are considered a fairly easy crop to grow. 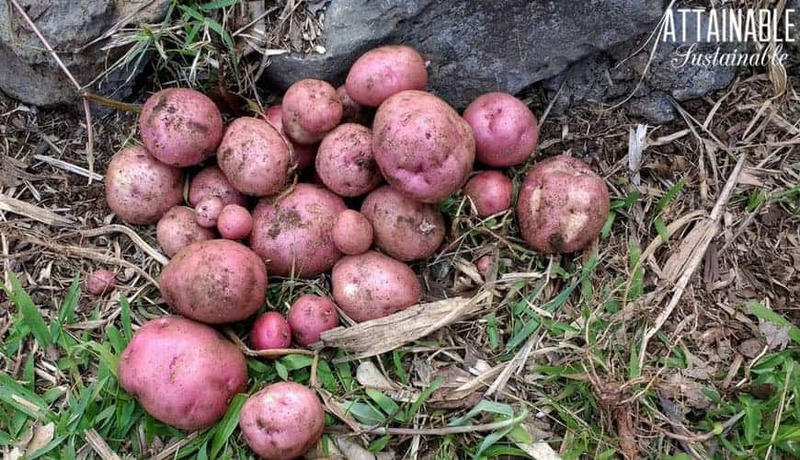 When it’s time to choose which type of potato to plant, you might be surprised to find there are well over one hundred varieties of potatoes out there to choose from. To decide, consider your family’s favorite way to enjoy the starchy tuber. Most French fries, hash browns, and other fried varieties use Russet potatoes, which are one of the most common varieties available. If hearty stews and potato salads are your preference, you’ll want to opt for a waxier potato, like Yukon Gold, which retain their shape better when boiled. Colorful potato varieties can add an element of fun to your kitchen. Make these fried red potatoes or this red potato salad recipe. Pink, red, and purple potatoes are especially fun if you’re trying to help picky kids expand their palates or add a visually exciting element to your meal. The various types of potatoes are divided into three categories – early season, midseason (sometimes called second earlies) or main crop. Early season potatoes mature the fastest, producing a finished product in about 90 days. Midseason potatoes, like Yukon Golds, take around 100 days to fully develop. Main crop potatoes include varieties like Russets and take the longest time to grow. If you grow all three varieties and stagger it just right, you’ll have fresh potatoes from your garden for months! Potatoes can tolerate a light frost or two. This means it’s usually safe to start planting potatoes as soon as the soil is tillable. To be safe, reference your local weather to determine the average date of the final frost. To grow potatoes, you’ll use seed potatoes – which aren’t seeds! Instead, you’ll plant potatoes that have sprouting “eyes,” the new buds that ultimately transform into a brand new potato plant. Choose potatoes that are healthy and disease-free — no rot, blemishes or bruising. And make sure you purchase seed potatoes specifically for growing. While growing potatoes that have spent too much time in your pantry can turn into a harvest, they’re not the best option. Instead, start with seed potatoes from your local nursery. While not absolutely necessary, chitting potatoes (letting them sprout before planting them out in the garden) gives them a head start. Moving seed potatoes into a warm (70 degrees Fahrenheit) location will break their dormancy, causing them to start sprouting. You know your seed potato is ready to plant when the sprouts are between a half-inch and one inch long. You can plant the whole potato, but if the potatoes are large, cut them into smaller pieces before planting them. If you cut your seed potatoes into smaller pieces, make sure you leave at least one eye on each piece of potato. Cut them a few days before you plan to actually plant them so the cut edges can dry. This prevents rot or spoilage once they’ve been planted in the moist soil. The soil for growing potatoes should be light and loose, and amended with compost. Potatoes need room to grow! 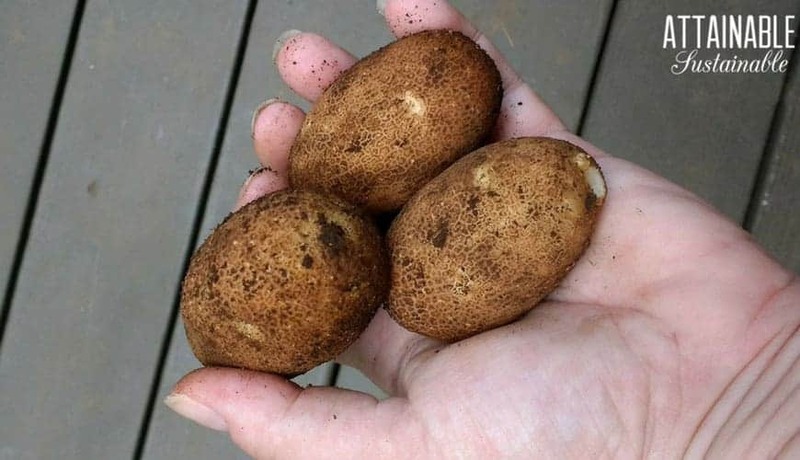 If the soil is too compact, you’ll end up with poorly-shaped potatoes. Give them a little room to breathe, and make sure there’s plenty of moisture. How to grow potatoes: In the ground or in containers? When determining how to grow potatoes at your place, you’ll need to decide what type of growing method will work for you. Planting potatoes in hilled rows directly in the ground is one of the most common methods for growing potatoes. It’s the way farmers have grown potatoes for centuries, and it’s best suited for gardeners with lots of space to grow. Create trenches two or three feet apart from one another and plant your potato seeds four to six inches below the surface. Allow about 12 inches of space between seed potatoes. Cover the seed potatoes with about an inch of soil. Don’t fill the trench in all the way. Once the potato sprouts emerge, shovel in more soil, leaving only a few leaves peeking above the surface. Repeat the process every couple of weeks to ensure the majority of the plant remains covered until the trench is completely filled in, or even hilled up. Burying much of the stem in this manner gives the growing potato plant a larger root system, and thus a bigger harvest. 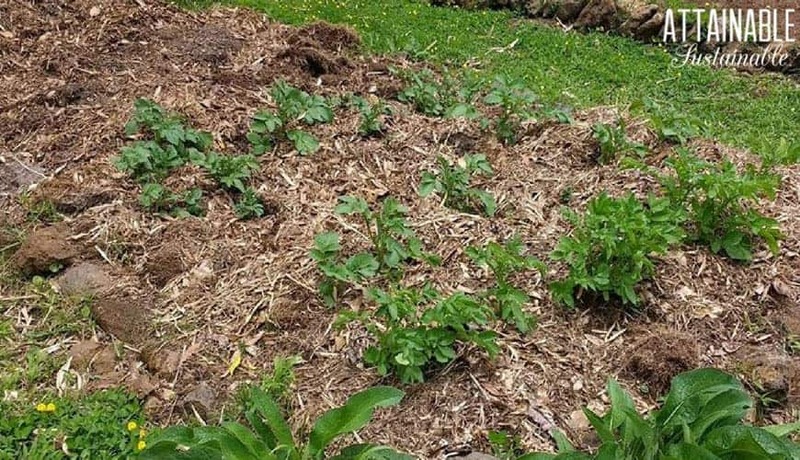 Raised garden beds can be a great way to grow your potatoes, since they eliminate a lot of the headache that comes with tilling the soil each year. 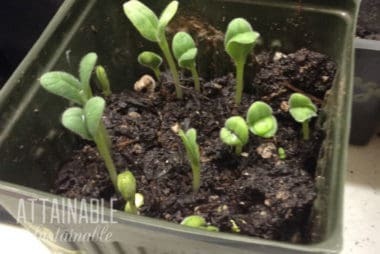 Similar to using the hill method, dig small trenches in your garden bed, plant your seeds 10 to 12 inches apart, and cover them with a few inches of loose soil. Add additional soil to cover the plants and build your hills as your growing potatoes continue to produce new leaves. If you’re faced with space constraints, growing potatoes in containers can be a great way to keep them confined and turn out tasty tubers. 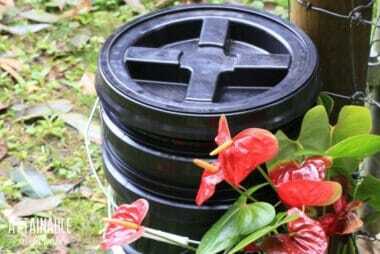 Choose a container with lots of holes to prevent your soil from staying overly moist. Some gardeners use wire containers lined with hay. Start with a small amount of soil – only a few inches to cover the bottom. 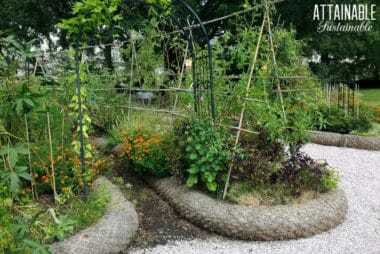 Add your seed and a few more inches of soil, water well, and let it grow! 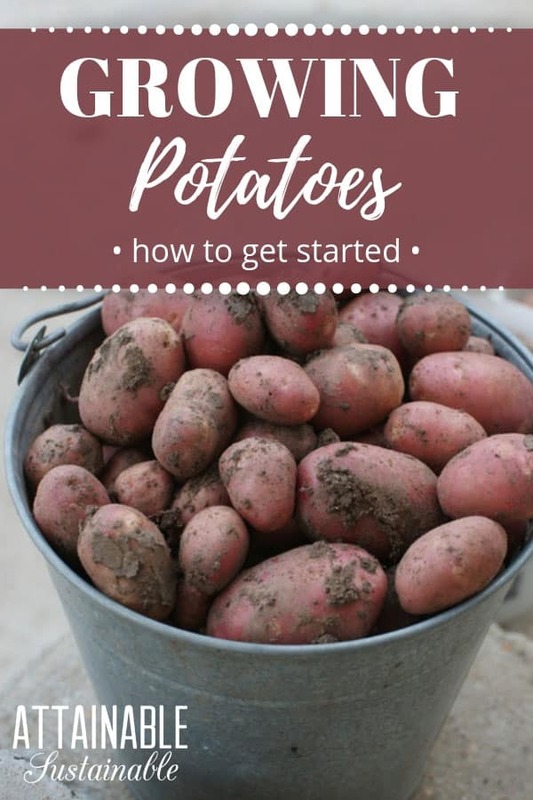 Similar to the other methods discussed here, continue to add additional soil to your pot as your potatoes grow, keeping your potatoes covered up and growing strong. Aphids are a common garden pest, and they certainly don’t discriminate against potatoes. These little insects munch on leaves and stems and can cause serious damage by infecting healthy plants with viruses. Potato beetles are small, oval-shaped bugs with yellowish-orange stripes, and they lay their eggs on the bottoms of leaves. If you find these pests in your garden, you’ll want to address the problem ASAP. Pick off any visible bugs and eggs. Encourage natural predators, like ladybugs, to live in your garden to fend off harmful critters, too. Neem oil kills potato bugs while preserving the health of your potato crop. 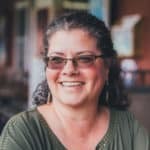 Blight is another problem impacting farmers and home gardeners alike. It’s caused by a fungus that spreads through spores carried by the wind. It’s hard to fully protect your garden from it. Keep an eye out for brown spots on the leaves of your potato plants. These brown spotted areas can develop yellow borders – another telltale sign. Remove leaves that show sign of blight as soon as you spot them. Destroy the leaves — don’t compost them. If the blight continues to spread, you’ll need to get more aggressive, removing plants that show signs of infection. You’ll want to get ahead of blight as quickly as you can – it can spread to other plants in your garden and wreak havoc on your harvest. Potato scab is one more common problem that potato-growers face. Potatoes with potato scab aren’t bad to eat – they just don’t look as enticing as they should. 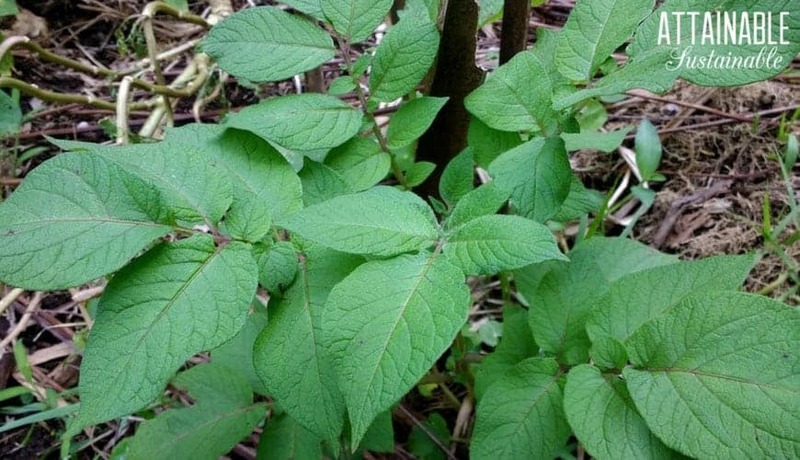 The best ways to avoid this issue are to plant healthy seed potatoes. Also, ensure you aren’t overwatering your plants and make sure your soil isn’t excessively acidic. The bacteria that causes potato scab to develop thrives in highly acidic environments. Managing soil pH levels can be a great way to defend against this blight. How long you wait between sowing your seed potatoes and harvesting potatoes will depend on a variety of factors. When you planted your crop and how large you want your potatoes to be will determine harvest time. If baby potatoes are your goal, you’ll harvest these from the living plant, a few weeks after it’s stopped flowering.To do this, gently loosen the soil around the base of the plant. Use your hands to feel in the soil for baby potatoes. Pull them from the plant, leaving the potato plant and roots intact. 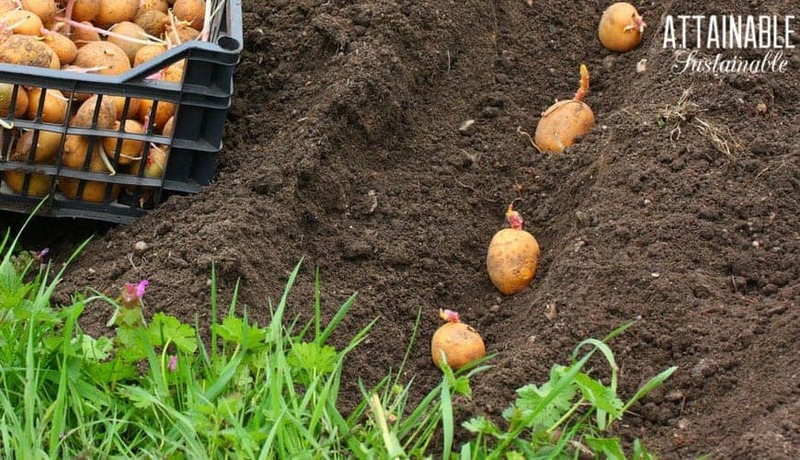 If you’re aiming for standard potatoes, however, you’ll harvest your crop anywhere between two and four months after planting. How do you know your potatoes are ready to harvest? Wait until the stem and leaves of the plant begin to dry up. From that point, you should wait a couple more weeks before harvesting your crops. If the ground is wet from rains, you’ll need to pull them sooner. Potatoes are delicious, nutritious, and when stored properly, they have an extremely long shelf life. This allows you to enjoy home-grown potatoes well after the growing season has ended. After you’ve harvested your potatoes, you’ll want to let them dry out for a few days or even a couple of weeks. This waiting period is crucial – it gives the potato skin time to dry. This helps potatoes keep long after you’ve pulled them out of the ground. Potatoes should be completely dry before they’re stored. Place dry potatoes into paper bags or cardboard boxes and keep them in a cool, dark place. Potatoes keep best between 45 and 55 degrees. In the absence of a climate-controlled environment, store potatoes in a basement or the back of a cupboard. They should be stored in a dry area, away from moisture and humidity.